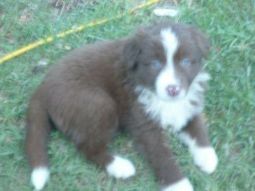 Australian Shepherd breeders links and breed information on pups4sale.com.au. pups4sale testimonial: Not only were your (customer service) replies informative, they were unbelievably speedy in response to my enquiries and always open-ended if I still encountered difficulties. You may think the Australian Shepherd is from Australia, but the fact is that it was originally bred in the United States. The name is just one of many that it has been given, others include the Spanish Shepherd. It's a lovable and smart breed, so it's no surprise that it's so popular around the world. The Australian Shepherd might be known for its wit more than anything else because it's not rare at all for it to outsmart its owner while playing games or even when it's training. This is one of those breeds that has many different personalities, so owners need to be prepared for anything when they choose to own an Australian Shepherd. Thanks to Inneslake Kennels for the pictures of puppies & adults used on this page, and the additional information provided. The breed is a medium-sized dog built for agility. They stand anywhere from 18 to 24 inches off of the ground and can weigh between 40 and 65 pounds. While there are many things, like its pointed ears, that make it very distinctive, the Australian Shepherd is known for its blue, amber, or mismatched-colored eyes. 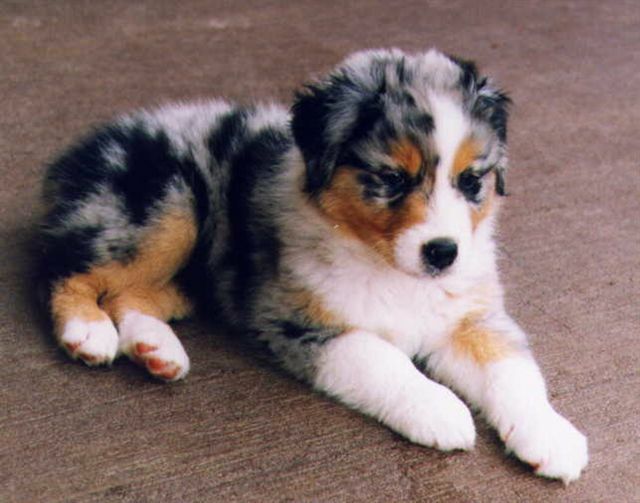 Australian Shepherds have very thick, medium-length coats that cover their entire bodies. This allows them to live comfortably in the cold, but Australian Shepherds that live in warmer areas will adapt by shedding their thicker coats down.In terms of color, Australian Shepherds have a wide variety of mixed color patterns. Some can be beige with a red tint, while others can have up to three colors mixed in. 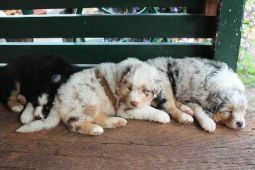 What makes the breed different than most others is that while they all do have some things in common, you will find that there isn't one set of personality traits in any two Australian Shepherds. In some ways this is fantastic because you know that you are going to have a unique dog, but it also makes it difficult to predict how hard it will be to train them and how they will react around people and other animals.Even though they have varying personalities, most Australian Shepherds love to cuddle with their owners and they can be one of the more playful breeds. They become very protective of their owners, so it's good to get them used to other people and animals being around early on in their lives.Australian Shepherds were bred to be herders, so it's not uncommon for them to chase other animals or even automobiles. This is why it is vital that Australian Shepherd owners must keep them on a leash at all times when they are outside of the house.Australian Shepherd puppies need as much time interacting with people and dogs as possible so they become good social dogs when they become adults. While some Australian Shepherds are shy by nature, getting them used to being social will always help them to become at least a little more outgoing in the future.Australian Shepherds are known for being really good family dogs, so they are normally great with children. They are smart and crafty, though, so it's not smart to have children walk them where there will be other animals around. Some individuals are great with other dogs, while others aren't. It really depends on their upbringing and whether or not they were socialized early on. Some Australian Shepherds end up behaving very well with all people and animals; it really just depends on the dog.Australian Shepherds aren't really popular as guard dogs, but most of them will bark when they get nervous or anxious, so they will usually alert their owners if intruders are around. Still, people looking for great guard dogs probably should look for another breed as their top choice.All Australian Shepherds are different,so they will all react differently to being left alone. Some will be absolutely fine with it, while others will incessantly bark until someone comes home. Like with all other breeds, though, they shouldn't be left alone for too long or they could destroy things in the house and become depressed. Australian Shepherds are very smart dogs. They work hard to earn their owners' praise, so once you get through to them the first time, it's usually smooth sailing from there. All it takes to train an Australian Shepherd is a little bit of repetition and some treats.People are usually amazed by how easily Australian Shepherds learn all of the basic commands. They can learn them very quickly and move on to tougher commands and tricks at a very early age if trained properly. You'll often find that once an Australian Shepherd knows that it is doing something correctly, it can't wait to move on to the next command or trick.People who fail to train their Australian Shepherd will find it's a very hard breed to live with. They have a natural herding instinct, so they can destroy homes and even attempt to herd people if they haven't been taught to control themselves. People absolutely have to be willing and able to train this breed. Australian Shepherds are workers by nature, so they have an inherent need to run around and exercise. Outdoorsy types will absolutely love Australian Shepherds because there aren't too many breeds out there that love to fetch and just run around in the open than the Australian Shepherd. It's hard to get an Australian Shepherd tired, but they should be walked as much as possible to keep them from becoming bored inside the house. A couple of long walks every day and a little bit more exercise does this breed well. Australian Shepherds are a very heavy shedding breed, so potential owners need to be ready to do a lot of grooming all year round. The benefits of brushing a couple times a week will be an dog with a beautiful coat and a dog that is comfortable. The good thing about Australian Shepherds, as far as grooming goes, is that they stay relatively clean, so they won't need too many baths. The only times that they need to be bathed is when they start to smell or when they get dirt all over them.Of course, cleaning the ears, nails, and teeth is also necessary to keep an Australian Shepherd in great health. All of this grooming only takes about an hour or two a week, so while it may seem like a lot, it's something that you can definitely get used to. Australian Shepherds live pretty long lives, with most of them living 12 to 16 years. A healthy Australian Shepherd can even live a few years longer than that.Like every breed, there are some health issues that are common with the Australian Shepherd. The most common are cataracts, dental issues, and allergies. 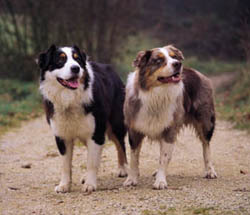 On the overall, though, the Australian Shepherd has good genes and is known as one of the healthier all-around breeds. Just about anyone who is willing to take care of a dog properly would be a good owner for an Australian Shepherd. They can have many different personalities, but someone who is willing to be patient and work with their dog will find it's an easy breed to work with in time. A big house and yard isn't absolutely necessary for a Australian Shepherd, but owners with smaller homes need to be ready to give their Australian Shepherds a lot of exercise outside to make up for less space in their homes. An Australian Shepherd just needs to wear itself out each day to be happy, so owners who take the time to let their dogs do that will have very happy Australian Shepherds.Australian Shepherds are almost as good as it gets when it comes to family dogs, because most of them love interacting with people and the more people there are to interact with, the happier the dog. People who don't have a lot of time in their days to go out and run with an Australian Shepherd should not adopt this breed. They don't respond well at all to being left in the house all day, so if you know that you aren't going to be able to spend a lot of time with a dog, either get another breed or wait until you have the time an Australian Shepherd needs.Shedding is an issue for some people, so if you think that you don't have time to brush your dog regularly or you don't want hair all over the house, this breed is probably not for you. They will shed, and they will shed a lot. 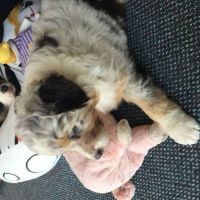 All in all, the Australian Shepherd is a great breed that just about anyone would love to own. They are just about as smart as dogs come and are a lot of fun to play with both as pups and as adults. 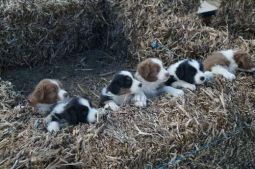 The fact that they have many different personalities is actually a good thing because every one of them is going to have all of the best traits of an Australian Shepherd and the other traits will give each owner a unique experience with the Australian Shepherd they end up getting.